Did you look for a fun Online Netelller Casino that offers Neteller as deposit method for you to play? Well, look no further! You found the most classy Casino on the web, with over 400 game titles in stock and the option for Neteller! Why choose a Neteller enabled Casino? Neteller has been a reliable deposit method for almost twenty years! It has been a popular service in the gambling world ever since it’s release in 2000. Hundreds of companies use Neteller today and Royal Swipe Casino is no exception. Neteller is secure, simple and fast. For deposits AND withdrawals! If you choose Neteller as your pay and play method, Royal Swipe rewards you by offering you aWelcome Bonus 100% up to $/£/€100 + 20 Free Spins on Shaman's Dream on your first deposit! How is that for a welcome bonus?! Join us now! Next to our royal welcome bonus we offer a weekly promotion every tuesday! The more you play, the more we pay! Getting access to all of our Casino games, Mobile Scratch Cards and Jackpots is easy as 1,2,3! First off, Go to our registration page, fill in the form and verify your account with your mobile phone. Next, choose your primary deposit method. In your case Neteller. 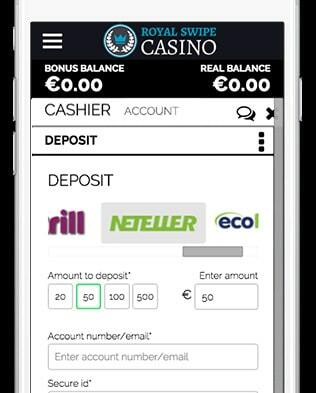 Finally make your first Neteller Casino deposit and instantly get rewarded with our welcome bonus! 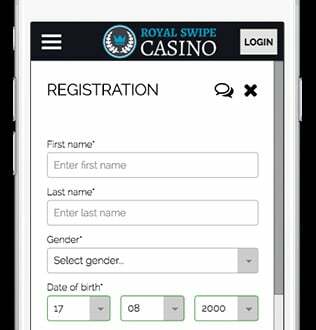 There, you now received your welcome bonus and unlocked all 1700 games to play on our Royal Swipe Neteller Casino! You can play all of your favorite games on all devices and at anytime you like, so what are you waiting for?